For me it is a life changing product. This winter I felt my skin dryer so I've decided to give it a try and miracle!! I finally understood that my skin not oily but mixed and dehydrated, with few weeks of used I've noticed my skin is getting less oily during the day. The product is not too greasy but gives gives long lasting hydration and a visible overall improvement of skin appearance: texture, tone, fine lines. Overall it contains a little percentage of retinol which helped me to get used to retinol without irritation. Definitely a five star product!! This moisutizer is my favorite and I’ve been using it for about 5 years. My skin was sensitive and I often got breakouts, but this moisturizer together with 2% bha has made my skin calm and normal, I never have problems with my skin anymore. Thal - It works ! I love this product, it really works, my skin glows and seems younger at the morning ! Niamh - Love this- my favourite - will continue to stock up! I have really combination skin. Oily forehead nose & chin. Very dry under eyes and around the orbital bone. This lotion is perfect for me. Not too heavy and hydrates enough. Not too light either. It is just right. If my under eyes are really dry, then I use the Resist Moisturizer for very Dry Skin & use this moisturizer all over the rest of my face. I first tried this last year during winter when the heating season is on. I have to say that I already used a moisturiser on a regular basis, but when I applied this one, I could feel that my skin started absorbing it immediately. I have combination skin, and whenever I put on a moisturiser of other brands, my skin would look really greasy, but not with this product. I usually apply it in the evening and my skin looks refreshed in the morning. I first had a sample version, then the trial version, and now I am on my 1sr full size bottle (also used it in the summer, and my skin wasn't greasy either), with 2 new ones ordered. I'm 29 with a combination skin type, on the normal side since I have switched my skincare to Paula's Choise 4 months ago! I ordered a trial size of this moisturiser to see how my skin will react to retinol. I used this at night with 2% BHA gel and Resist Anti-Aging Super Antioxidant Concentrate Serum, completing with Resist Anti-Aging Barrier Repair Moisturizer with Retinol and some face oil occasionally. I got dry flaky patches on my chin for the first time in my life. It might be too soon for me to worry about wrinkles, but I would like to leave open possibility for a retinol product in my skincare, may be there is some advice you cold give me on trying it? Customer Care: Thanks for your reviews! 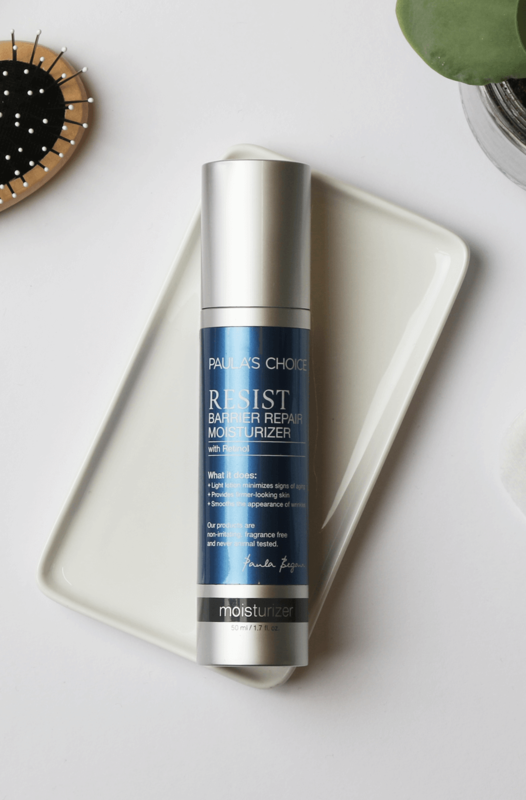 We're sorry the Resist Anti-Aging Barrier Repair Moisturizer with Retinol wasn't fit for you! Be sure to contact our Customer Care for assistance. Makes my skin glow and seems to make minor impurities disappear over night. Makes noticeable improvements in smoothness of the skin. One of my favorite products in my skin care routine. Surprisingly moisturising. This is one, is one of very few of Pauls choice products that doesn't irritate my skin, but I am not surprised since about 90% of everything I try don't work for me. Yes, I do statistics. I bought this moisturizer to help with my dry and sensitive skin with occasional blackheads. After 2 weeks of usage my skin is flaky, red and irritated. Will stop using and continue searching for a good moisturizer. This is surprising since Paulas products usually play nice with my skin. Customer Care: Thank you for your review. We are sorry to hear of your experience and discomfort. Although this is not a common response, we do understand that each customer is uniquely different in how they will respond to products or ingredients. Please contact us to discuss other options. This is my absolutely favourite moisturizer, it's the only one I've used for the last 3 or 4 years. I have dry and sensitive skin that is also quite reactive (I get red blotches after a comfortably warm shower). This moisturiser is pure wonder for my skin! It absorbs quickly, reduces my redness and leaves my skin feeling soft and supple. The texture is very silky & light and there is no scent to speak of. It spreads easily and seems to have great coverage - so a little goes a long way. I usually use it after I have put on a couple of drops of face oil (argan or jojoba), which of course feels slightly greasy, and it seems to help absorbing all of it into my skin. I tried about ten samples of this cream, because I have sensitive skin and I always fear it can react badly when I start using a new product. I have combination skin, mild (at the moment at least) rosacea and quite a lot of little bumps all over my face. This moisturizer is light and it doesn't leave me oily at the end of the day, but maybe it isn't enough for my cheeks where I'm a bit on the dry side (I only notice this when I put my mineral foundation on and I see some dry patches, otherwise this cream does a decent job on my cheeks as well). I didn't notice more bumps or blemishes, which is good, but it's also true I didn't test it enough. Overall I'm quite satisfied and I think I'll give the full size a go after the summer (I want something with SPF for the summer). The only completely negative side of my Paula's choice so far is that the shipping fees to Italy are too high, especially for the full sized products. This is great for moisturizing, however I didn't see results on my fine lines( I'm 30 and my fine lines are not visible unless im wearing makeup). I finished my bottle a few months ago and my skin doesn't seem to be worse, so not sure it worked other than to moisturize. It changed very much the appearance of the nasolabial folds which were my thick wrinkles ( I have the nasolabial folds and the frown lines. This happened in 48 hours! The reason I didnt give 5 stars is because the eye area has shown a worse appearance I dont know why. I continue the treatment and I may come back with the results of longer use. I feel very happy that I bought this product because I never hoped that I could make those thick wrinkles look almost invisible. I believe this is a miracle product!!! I look younger in only 48 hours!!! ( I am 43 and I have combination skin). I agree with the rest of reviewers: the moisturizer is fantastic, even if I could wish for a bit more oomph - often I also want to add one more (one more!) layer of moisturizer after using it. I am considering buying the moisture boost cream to add on top. But I really have to get used to using so many products - before I switched to Paula's products (about three months ago), I would use cleanser and one cream at night and sunscreen during the day. Now I also use toner (from the Resist line - I am addicted now! ), exfoliant (5% and 10% AHA) and moisture barrier repair at night and serum and moisture barrier repair and then sunscreen in the morning. It is expensive with so many products, but my skin looks really good so it is worth it! I don't think the pump issue has been resolved; my pump started giving me trouble after about a couple of weeks as well - not springing back up when you pump down. Please fix! Customer Care: Thank you for your review.We can assure you all review feedback is passed along to Paula and her team.We will send you a replacement in the meantime. Please contact customer care with any questions. After a week of applying this twice a day my skin looked and felt terrible: dry, flaky and itchy. It still hasn't gone back to its usual happy self, and it's been two weeks now since I stopped using 'Resist'. 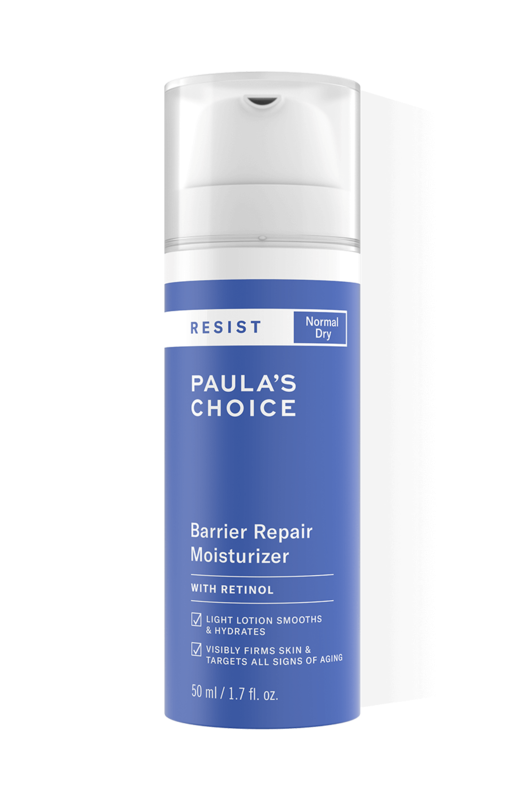 Before trying 'Resist' I used Paula's Moisture Boost Hydrating Treatment Cream for two years. I'll go back to that. Customer Care: Thank you for your review. We are sorry to hear of your experience with this product. We do understand that each customer is uniquely different in how they will respond to products or ingredients. This along with everyday environmental factors can sometimes play a part in how someone will ultimately respond to a product or combination of products. For that reason, we have located your account information and will apply a credit for the product. Our customer care will contact you for further details. I have combination skin and it's excellent for use on winter. Really works for my skin. I was already pretty happy with my skin when I first ordered this but I felt like trying something new. I didn't intend to reorder, but once the product was used up, I really noticed a difference: when this is missing from my routine, my skin seems noticeably less smooth. So now I wouldn't be without it. Super moisturizer, trekt snel in, plakt niet (eindelijk een creme die NIET plakt) en er zitten ingredienten in die echt werken, zoals antioxidanten( b.v retinol) etc. Heb al veel dure creme's gebruikt, bv. Lancome, Clarins en Clinique en niks hielp. Wat ook een groot plus punt is, is dat Paula haar producten in tubes of pomp verpakking verkoopt, waardoor de ingredienten dus behoud blijven, inplaats van al die pot verpakkingen!!! Met de persoon Manon ben ik het al helemaal niet eens, ja inderdaad je kan wat rode vlekjes krijgen in het begin, dit komt door de retinol, dit gaat weg na verloop van tijd, en als het te erg is moet je het langzaam opbouwen, dus om de dag ofzo. Als je de beauty bible had gelezen dan had je dat geweten, dus doe je huiswerk eerst voordat je oordeeld over iets. Weet je waar je pas uitslag van krijgt, van Clinique met al hun synthetise rotzooi!!!! In english they say: Don't judge the book by it's cover!!! Ik ben super blij met Paula, zij is tenminste eerlijk en durft er voor uit te komen, en al helemaal met de prijs waar zij haar producten voor verkoopt, inplaats van die idiote prijzen voor producten met ingredienten die helemaal nergens over gaan. Lees eens haar boeken en bestudeer de ingredienten lijst, dan zul je zien wat voor troep er allemaal verkocht wordt voor de meest krankzinnige prijzen!!!!! Love you Paula, you finally opened my eyes after wasting soo much money on crap. You really are a gem!!!!! Angela - Works for my sensitive skin! I am happy I found a potent serum with retinol and vitamin C that my very sensitive skin tolerates without any blemishes or rashes. I am allergic to all kinds of pollen, food, perfume and many cosmetic ingredients and i react with rashes and hives. This product does not irritate my skin at all, I follow it up with thermal water toner + 3 drops of Rosehip oil to lock in the moisture. I'd call the product a serum though and not a moisturizer. My skin would be left too dry if I wouldn't apply the oil afterwards. I have combination/dry skin. After using this cream I have to reaply the Moisture Boost Hydrating Treatment Cream which I love on top because by itself it doesn´t moisturize my skin at all, it leaves my skin feeling tight and uncomfortable. The ingredient list is amazing there´s no doubt about that but this cream just doesn´t work for me. Customer Care: The choice of the perfect moisturizer depends i.a. on your personal preference. Sometimes you have to try out which moisturizer suits your skin best. For the dry parts of a combination skin we advise the use of the Moisture Boost Hydrating Treatment Cream or Skin Recovery Moisturizer. I really wanted to believe this product would fill my expectations due to its impressive assortment of ingredients which I know they're really beneficial for the skin but after a lot of trials I have to admit isn't for me. After the product has absorbed my skin looks shiny and ... how to say?, it remembered me when I used to apply a moisturizer with alcohol in the past. It means more rough and cracked. I suppose some ingredient/s here maybe are not so good for my skin as for the other users(most of them love it). Although usually your products work for me(most of them amazing), what a shame I cannot use your last innovating product. I give it 3 stars because although it made me feel disappointed I know it's a good product, . I cannot agree with Nell's review but I do for Eric's review(yes, the pump becomes worse after several weeks). Customer Care: The choice of the perfect moisturizer depends i.a. on your personal preference. Sometimes you have to try out which moisturizer suits your skin best. For a very dry skin we advise the use of the Moisture Boost Hydrating Treatment Cream or Skin Recovery Moisturizer. I want to write a review for this because I am truly amazed by this product. I´m a great sceptic (also I´ve grown weary regarding cosmetic claims, thanks to reading Paula´s reviews and books for many years), so I was a little dubious that Paula, while surely having created a solid product, was making these kind of claims for the new moisturizer, they are very near or even right on the thin red line to marketing hype as usual in the world of skincare. But what can I say? After using this moisturizer for four weeks, I am left with balanced, glowing, blemishfree and smooth skin, like I haven´t had in years (I´m not old, but at 34 not as fresh as I used to be). I also had a stubborn patch of atopic dermatitis on my eye that wouldn´t budge with either cortisone nor a drug for Neurodermitis, it went away in days, when using nothing but Resist. I am extremely happy that this cream exists, and I will continue using it morning (plus mineral sunscreen spf 25) and nights (with additional application of Skin Recovery Moisturizer, since my skin is too dry otherwise) as long as Paula doesn´t come out with something even more advanced as science progresses. I would only wish for a more emollient version, so I wouldn´t have to use an additional step in the evening. Thank you Paula, you did a lot for me and the health of my skin since I discovered your books in 1994! Great treatment moisturizer for combination skin, lovely gel-cream consistency, neither greasiness nor redness upon application, no smell at all, nice silky feeling on the skin, outstanding protective formula, very light irritation around the nose (the most sensitive part of my face, nothing unbearable)… it slightly lacks spreadability but spraying toner on fingers before application fixes this. The only problem comes from the pump which works fine at the beginning then doesn't reset completely anymore after one or two weeks.